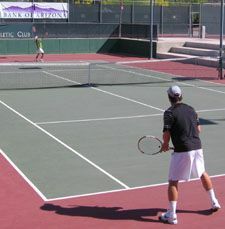 Players from all over the United States participated in the USTA National Men's 35 Hard Court Championships held at the Scottsdale Athletic and Resort Club this week. Local	players Jesse Ponwith, Gary Donnelly, Dan Marting and Bruce Nichols made the consolation doubles finals! Oren Motevassel defeated Andy Lake in the singles finals to win his third consecutive title! For a complele listing of all results and more photos from the event click here.